SEOUL, Nov. 2 (Yonhap) — South Korea’s spy agency is analyzing a soil sample collected from around North Korea’s nuclear test site, which Pyongyang demolished in May, lawmakers said Friday. 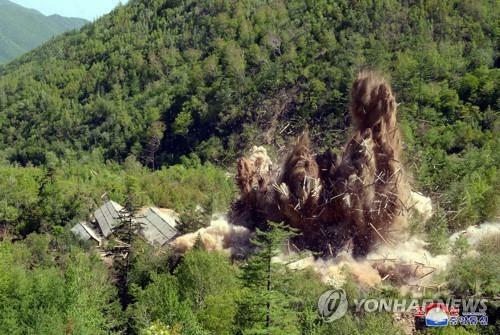 In May, the North demolished its Punggye-ri nuclear test site in a show of its will for denuclearization. The North has conducted all six of its nuclear tests there, including the latest in September 2017. When a nuclear test-inducing artificial quake was detected in North Korea, authorities collected traces of radioactive material in the air over the East Sea to get information about the North’s nuclear explosion. But this method has limitation in exactly grasping the details about North Korea’s nuclear tests. The spy agency also unveiled a 3-D program designed to scan and analyze the changes of a person’s body, which has been used for years to check Kim’s condition. It demonstrated the process during the committee’s meeting, the lawmaker said.